If you’ve been on the lookout for a sports multivitamin which can defend hard-earned muscle mass, MRI NO2 SPORTS MULTI should be right up your alley. It harnesses the powers of key micronutrients and anabolic ingredients for a better fitness experience, as you’ll find out in this review. Anabolic ingredients. Features the likes of l-arginine, citrulline malate, l-glutamine, and CarnoSyn Beta-Alanine. Insane source of vitamin B12. Gives you an otherworldly 41,667 percent of the daily value. High vitamin D content. Yields 625 percent of the daily value for stronger bones and a healthier heart. Other Ingredients: Microcrystalline Cellulose, Stearic Acid, Croscarmellose Sodium, Crospovidone, Hypromellose, Magnesium Stearate, Silicon Dioxide, Polyvinylpyrrolidone, Carboxypolymethylene, Triacetin, Peppermint Flavor, FD&C Red 40, Talc, Carnauba Wax. Directions: Take 3 caplets once a day before breakfast. Can MRI NO2 SPORTS MULTI help you defend hard-earned muscle mass? Another sports multivitamin which stands out is EFX Sports VitaDrive. We hailed it as “The New King of B Vitamins” and with good reason: its B vitamin arsenal makes other multivitamins pale in comparison (its lowest B vitamin content is vitamin B12 at an insane 3,334 percent of the daily value). Could there be a serious challenger looming in the horizon? On that note, make way for MRI NO2 SPORTS MULTI. This “is not your average multivitamin. NO2 SPORTS MULTI is specifically formulated with clinically-proven ingredients to help build, pump and defend your hard-earned muscles,” per the manufacturer’s official website. The company’s definition is spot on. MRI NO2 SPORTS MULTI is unlike any sports multivitamin we’ve ever sized up. Its formulation sets it apart from the rest of the pack. We’re confident bodybuilding enthusiasts will reap its immense benefits over the long haul. As always, the first thing we look for when we size up a multivitamin is an “All-Natural” or “GMP-Certified” label. “Good Manufacturing Processes (GMP) are guidelines that provide a system of processes, procedures, and documentation to assure a product has the identity, strength, composition, quality, and purity that appear on its label. These GMP requirements are listed in Section 8 of NSF/ANSI 173 which is the only American National Standard in the dietary supplement industry developed in accordance with the FDA’s CFR part 111,” per NSF International’s official website. Our reasoning is simple: these labels assure customers a multivitamin has no synthetic ingredients (which is the last thing you want). You must be careful with what you put in your body. A label like this should throw any customer off. There’ no point in buying a multivitamin – let alone any bodybuilding supplement – which has ties to carcinogenicity and birth defects. Simply put, MRI NO2 SPORTS MULTI is off to a bad start. Granted, this is only a small sample of several leading sports multivitamins on the market today. Here’s the key takeaway: EFX Sports VitaDrive is still the undisputed King of B Vitamins. No competitor comes close. However, MRI NO2 SPORTS MULTI reigns supreme in terms of vitamin B12 (an insane 41,667 percent of the daily value) and vitamin D (625 percent of the daily value). Ergo, MRI NO2 SPORTS MULTI is an effective way of delivering oxygen to your muscles and maintaining optimal bone health and muscle function. “The emerging body of evidence surrounding vitamin D and athletic performance is bolstering support for the need to control vitamin D concentration in athletes. Undoubtedly, adverse risks are associated with vitamin D deficiency that will affect athletic performance directly and indirectly,” per the January 24, 2018 issue of the Auckland, New Zealand journal Sports Medicine (via NCBI.NLM.NIH.gov). On the flip side, it doesn’t have three B vitamins (vitamin B1, vitamin B2, and vitamin B5). This is the first sports multivitamin we’ve seen which has this distinction. These three B vitamins have a common denominator: they help increase energy levels. Will their absence in MRI NO2 SPORTS MULTI affect your performance in a negative way? We don’t think so. We believe the sky high amounts of vitamin B6 (2,529 percent of the daily value) and vitamin B12 (41,667 percent of the daily value) will help pick up the slack. There are two other things about MRI NO2 SPORTS MULTI which leap out at us: its Pump Blend for Blood Flow and Power Blend for Muscle Growth ingredient combos. These feature traditional bodybuilding supplement ingredients which help give you an anabolic edge. The Pump Blend for Blood Flow takes up 3,020 milligrams per three-caplet serving. This blend features the alpha amino acid l-arginine and several of its variations, including l-arginine alpha-ketoglutarate (AAKG) and l-arginine hydrochloride. L-arginine is a known nitric oxide (N.O.) booster. As a vasodilator, it helps promote healthy blood pressure levels. It also increases muscle pumps and improves nutrient uptake – two critical benefits for athletes and bodybuilders. Plus, l-arginine supplementation also helps increase human growth hormone (HGH) levels. “It is well-documented that the infusion of arginine stimulated growth hormone secretion from the anterior pituitary. This increase in growth hormone from arginine infusion has been attributed to the suppression of endogenous somatostatin secretion,” per the December 31, 2004 issue of the Journal of the International Society of Sports Nutrition (via NCBI.NLM.NIH.gov). We’re certain this will pique bodybuilding enthusiasts’ interest in l-arginine, to say the least. Unfortunately, fitness experts have given l-arginine flak for its poor solubility. Plus, they say its vasodilatory effects wear off after a short while. Good thing MRI NO2 SPORTS MULTI has the more reliable l-citrulline malate in its Power Blend for Muscle Growth (350 milligrams per three-caplet serving). L-citrulline malate is a combination of the non-essential alpha amino acid l-citrulline (which is also a natural ingredient of watermelon) and malic acid. L-citrulline is a precursor to l-arginine. The former has the same nitric-oxide-boosting benefits as the latter. However, l-citrulline has far better solubility prowess. The inclusion of malic acid helps increase exercise performance, particularly aerobic performance. However, experts are gushing over l-citrulline malate’s ability to complement strength training and recovery. “The use of CM (l-citrulline malate) might be useful to increase athletic performance in high-intensity anaerobic exercises with short rest times to relieve post-exercise muscle soreness,” per the May 2010 issue of Journal of Strength and Conditioning Research (via NCBI.NLM.NIH.gov). Long story short, MRI NO2 SPORTS MULTI can help you crank out more reps in the weight room. The inclusion of other time-tested bodybuilding supplement components such as l-glutamine and beta-alanine help substantiate this multivitamin’s claim of defending hard-earned muscle. The biggest downer is the manufacturer’s use of shady proprietary blends. Notice it doesn’t break down the individual ingredient amounts of the Pump Blend for Blood flow and Power Blend for Muscle Growth. This doesn’t bode well for the customer at all. 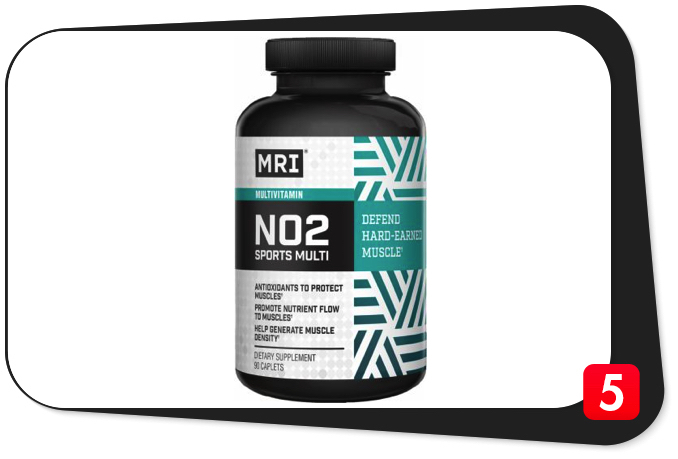 Our first impression: MRI NO2 SPORTS MULTI is an impressive yet flawed sports multivitamin which can help you defend your hard-earned muscle. Clearly, it’s not the best sports multivitamin on the market. However, it can still make a difference in your bodybuilding lifestyle. Vitamin A (as retinyl palmitate), 75 mcg: This vitamin not only helps boost vision, but it also helps strengthen bones, regulate immunity, boost heart health, keep free radicals at bay, and increase muscle mass. MRI NO2 SPORTS MULTI has a relatively low amount of vitamin A at just eight percent of the daily value. Vitamin C (as calcium ascorbate), 387 mg: Vitamin C does more than just ward off the common cold. In fact, it’s a powerful antioxidant which stifles free radical activity. It also helps regulate blood vessel function, promote healthy blood pressure levels, and improve eyesight and cardiovascular function. Vitamin D3 (as cholecalciferol), 125 mcg: This vitamin helps strengthen bones, boost heart health, and regulate calcium and phosphate levels in the body. MRI NO2 SPORTS MULTI has one of the highest vitamin D amounts among sports multivitamins at an impressive 625 percent of the daily value. Vitamin K (as phytonadione and menaquinone), 100 mcg: This vitamin helps regulate blood clots, immunity, and digestion; promote healthy blood sugar levels, and strengthen bones. Vitamin B3 (as niacin), 45 mg: This B vitamin helps increase exercise performance, improve joint mobility, and boost cardiovascular function. Vitamin B6 (as pyridoxine HCl), 60 mg: Vitamin B6 plays a key role in energy and hemoglobin formation. It also helps improve heart health. MRI NO2 has an insane 3,529 percent of the daily value for vitamin B6. Folate (800 mcg folic acid), 1,333 mcg: Vitamin B9 helps regulate cholesterol and hemoglobin levels, improve cardiovascular function, ward off free radicals and anxiety, and promote muscle tissue growth. Vitamin B12 (as cyanocobalamin), 1,000 mcg: MRI NO2 SPORTS MULTI is hands down the undisputed King of Vitamin B12 content. It has an otherworldly 41,667 percent of the daily value for this vitamin. It easily trumps the previous title holder, NOW Men’s Extreme Sports Multi (16,667 percent of the daily value). This B vitamin helps transport oxygen to tissues, ramp up energy levels, and improve heart health. Calcium (as calcium ascorbate), 40 mg: MRI NO2 SPORTS MULTI is not a significant source of calcium at a paltry three percent of the daily value. Magnesium (as magnesium oxide and magnesium citrate), 95 mg: Magnesium helps improve sleep quality, increase testosterone levels, regulate blood pressure levels, boost heart health, and keep stress levels in check. Zinc (as zinc oxide), 5 mg: Just like magnesium, zinc also helps improve sleep quality and ramp up testosterone levels. In addition, zinc also helps ward off free radicals, enhance cognitive function, regulate immunity, and strengthen bones. L-arginine: An alpha amino acid and nitric oxide booster which acts as a vasodilator for increased muscle pumps, healthier blood pressure levels, and improved nutrient uptake. L-arginine alpha-ketoglutarate: A salt which combines l-arginine and the metabolic intermediate alpha-ketoglutarate (an intermediate product of the Krebs cycle). Simply known as AAKG, this component helps raise nitric oxide levels, increase muscle mass, and ramp up anaerobic capacity. L-arginine HCl: This is a combination of l-arginine and hydrochloric acid, resulting in a compound which has better absorption properties than l-arginine on its own. Arginine ketoisocaproate: This refers to l-arginine bonded to ketoisocaproic acid, a keto acid of the branched-chain amino acid l-leucine (which helps kickstart the muscle protein synthesis process). Experts believe this combination has the same benefits as l-arginine supplementation. Calcium hydrochloride: This is a combination of the mineral calcium and hydrochloric acid. Calcium helps strengthen bones, regulate blood pressure levels, and boost cardiovascular function. L-arginine pyroglutamate: This combines l-arginine and a molecule of pyroglutamate. This component helps enhance cognitive function. ACTINOS CFM Niro P (whey peptide fraction): This component refers to nitro peptides and fractions of partially-hydrolyzed whey protein isolate (WPI), which is around 90 to 95 percent protein. It helps increase vasodilation and muscle pumps. Citrulline malate: This combines the non-essential amino acid l-citrulline and malic acid. The former helps increase nitric oxide levels for increased vasodilation and muscle pumps. It also helps improve nutrient uptake and blood pressure levels. Malic acid helps increase aerobic exercise performance. L-glycine: This non-essential amino acid helps support muscle development, promote healthy blood sugar levels, and regulate the nervous and digestive systems. L-glutamine: Glutamine is the body’s most abundant amino acid. It helps preserve muscle mass, increase human growth hormone (HGH) levels and weight loss, improve gastrointestinal function, enhance cognitive function, regulate immunity, and ward off free radicals. N-acetyl l-carnitine HCl: This non-essential amino acid helps ramp up energy levels, boost memory, and increase blood flow to the brain. 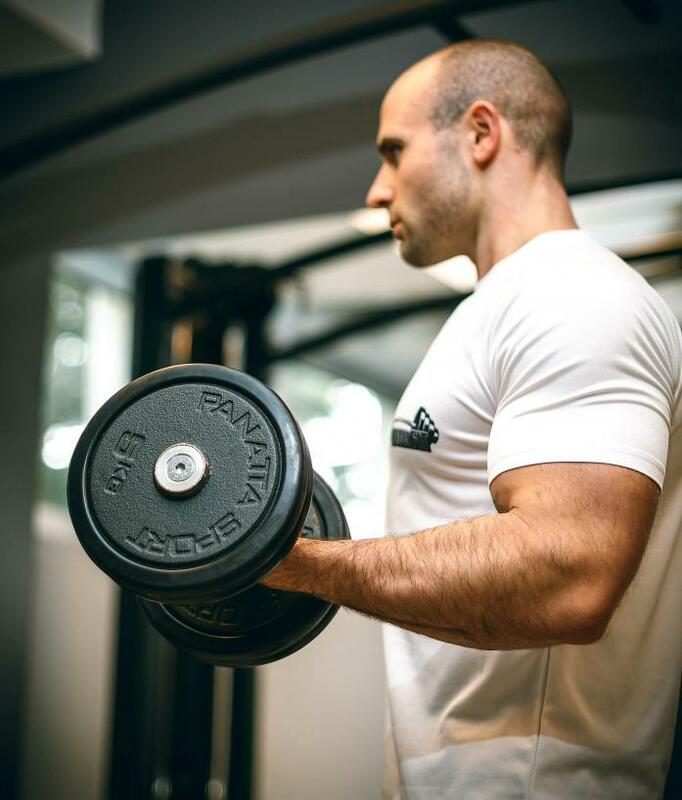 CarnoSyn Beta-Alanine: This is a naturally-occurring beta amino acid which helps synthesize muscle carnosine levels for increased work capacity and endurance, allowing one to work out longer and harder. This is the best beta-alanine brand on the market today. L-histidine: This is an essential amino acid which helps regulate hemoglobin function, ward off inflammation, and boost immunity. The manufacturer claims MRI NO2 SPORT MULTI is “not your average multivitamin” which helps “defend hard-earned muscle.” Honestly, we’ve never seen a multivitamin which harnesses the powers of athlete micronutrients such as this one. You won’t find many which boast of reliable muscle-building ingredients such as l-arginine, citrulline malate, l-glutamine, and beta-alanine. So yes, in some respects, this product does defend hard-earned muscle mass. As a sports multivitamin, MRI NO2 SPORT MULTI isn’t comprehensive in scope. Notice it doesn’t have vitamin B1, vitamin B2, and vitamin B5. However, the insane amounts of vitamin B6 (3,529 percent of the daily value) and vitamin B12 (41,667 percent of the daily value) can certainly offset these, especially in terms of increasing energy levels. On this note, MRI NO2 SPORTS MULTI is the new undisputed King of Vitamin B12 Content among multivitamins. It has more than twice the amount of the previous record holder, NOW Extreme Men’s Extreme Sports Multi (16,667 percent of the daily value). We don’t see another multivitamin trumping MRI NO2 SPORTS MULTI in this regard anytime soon. This supplement also has incredible vitamin D levels at 625 percent of the daily value. This is one of the highest – if not the highest – amount we’ve seen in a multivitamin. This much is sure to strengthen bones, keep free radicals at bay, and improve cardiovascular function. Better take advantage of the opportunity. MRI NO2 SPORTS MULTI’s other selling points are its Pump Blend for Blood Flow (3,020 milligrams per three-caplet serving) and Power Blend for Muscle Growth (350 milligrams per three-caplet serving). Here, you’ll find the ergogenic and anabolic components we discussed earlier – l-arginine, citrulline malate, l-glutamine, CarnoSyn Beta-Alanine, and the like. Their combined benefits include increased blood flow, vasodilation, muscle pumps, muscle mass, weight loss, and work capacity; healthier blood pressure levels and gut function, and enhanced cognitive function. What’s not to like here? It’s clear MRI NO2 SPORTS MULTI has its own unique identity. It’s a sports multivitamin with promising anabolic benefits. It’s not as comprehensive in scope as say, the aforementioned Universal Nutrition Animal Pak, but it has a great upside. Unfortunately, MRI NO2 SPORTS MULTI has two glaring loopholes: transparency and filler content. First off, the manufacturer fails to divulge the exact ingredient amounts of the Pump Blend for Blood Flow and Power Blend for Muscle Growth. In short, these are two shady proprietary blends. This doesn’t bode well for customers at all. This multivitamin also contains several fillers. It has FD&C Red No. 40, an artificial food coloring which has links to carcinogenicity. Let’s also not forget about the warning label we posted which says this product contains chemicals which may result in birth defects. It seems to us the manufacturer didn’t do its homework. The final takeaway: MRI NO2 SPORTS MULTI is a promising yet flawed anabolic sports multivitamin. It’s a good multivitamin for athletes but it’s clearly not the best on the market. Sure, it will also help you build the muscle mass you want, but it’s not the best alternative in terms of boosting long-term health. You’re better off taking a multivitamin from a more trusted brand such as NOW ADAM. MRI NO2 SPORTS MULTI “is specifically formulated with clinically-proven ingredients to help build, pump, and defend your hard-earned muscles,” per the manufacturer’s official website. The manufacturer intended MRI NO2 SPORTS MULTI for healthy and active individuals who are at least 18 years of age who want to increase muscle mass and sports performance, fill nutrition gaps, and achieve their daily fitness goals. MRI NO2 SPORTS MULTI conti has 281 percent of the daily value for vitamin B3 (niacin), an ingredient which may “cause certain side effects, such as flushing (warmth, itching, redness, or tingly feeling under your skin),” per the American College of Cardiology’s official website. This multivitamin also has FD&C Red No. 40, an artificial food coloring which has ties to carcinogenicity. If these, or any other ingredient, make you feel doubtful, please consult your doctor before buying MRI NO2 SPORTS MULTI. Solid formulation. Not comprehensive, but solid, nonetheless. Insane vitamin B12 amounts. At an otherworldly 41,667 percent of the daily value, no other sports mulvitamin comes close. High in vitamin D. Equal to incredible 625 percent of the daily value for stronger bones and a healthier heart. Anabolic ingredients. Has l-arginine, citrulline malate, l-glutamine, and CarnoSyn Beta-Alanine. Increases nitric oxide levels. L-arginine variations and citrulline malate combine to increase vasodilation. Affordable. One 90-caplet bottle costs just $15.19 on Amazon.com. Fillers. Contains FD&C Red No. 40 and other possible synthetic ingredients. Bad transparency. Pump Blend for Blood Flow and Power Blend for Muscle Growth are shady proprietary blends. We’re confident MRI NO2 SPORTS MULTI can help you defend hard-earned muscle, especially if you train consistently, eat healthy, get enough sleep, and supplement with it along with a big-name protein powder, creatine, or post-workout supplement. This muscle-building sports multivitamin is also the new King of Vitamin B12 Content among multivitamins. That’s saying something. Unfortunately, shady proprietary blends and fillers contradict this product’s claim of being the “not your average multivitamin.” Long story short, MRI NO2 SPORTS MULTI is a good yet flawed sports multivitamin. We recommend you buy it, but with some reservations. You’re better off buying cleaner multivitamins such as NOW ADAM instead.